Not too long ago I came across THIS site and story. I read a lot of historical books but never had any idea the scope of this! I decided to make a few blocks for the project. When I was young my parents encouraged me to write to a great aunt who never grew up mentally. 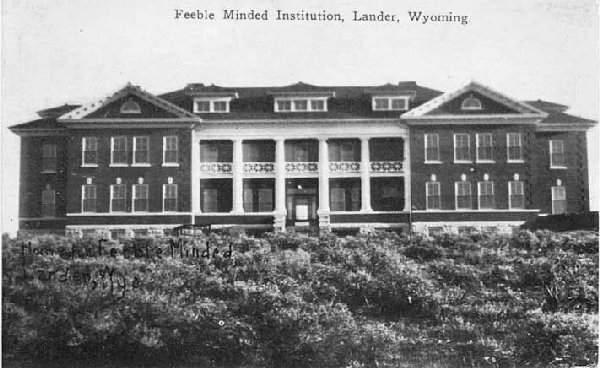 As I did genealogy I found out that my aunt was in this institution. Can you imagine that it would take 2 red x's on a doctor's report and the Nazi's would put to death "defectives"?! Terrifying! I'm not sure where the project is going but it was simple enough to make a few blocks to send in signifying the lives that were snuffed out so horrifically. Despite this downer kind of post, make it a great day! Heck, we're all defective in some way! Thanks for the history lesson. I am with you and will make some this week. Without question, my magnificent grandson, with his significant autism, would have been among the X's. I will make a special one for my super little guy! How lucky we are! Great and touching post ! I will do some blocks for this woman ! Thank you, Cecile. I look forward to you becoming part of The 70273 Project. If you have any questions or need anything, just holler. Lori, Thank you so much for this post and for becoming part of The 70273 Project, and for introducing us to your great aunt. I have an aunt who was institutionalized in the early 1950s after she attempted suicide. Six men signed the commitment papers, and when I interviewed some of them decades later (the family disowned her, but I vowed to learn everything I could and keep her memory alive somehow) and asked them to tell me about it, a few of them had the audacity to say that she was odd, uppity, and talked too much. Not a single one of them - not even the physician of record - bothered to find out what triggered the suicide attempt. "Feeble minded." That's a pretty good description of me some days . . . Thanks for Sharing Lori! We all come up short in some way, knowledge may prevent such autracities in the future. I just spent a wonderful week with my grandsons. One was born with Spina-bifida. Heaven forbid that we could again count anyone unworthy of life with value! I agree, Carrie, we all come up short in some way. Glad you enjoyed your grandsons. 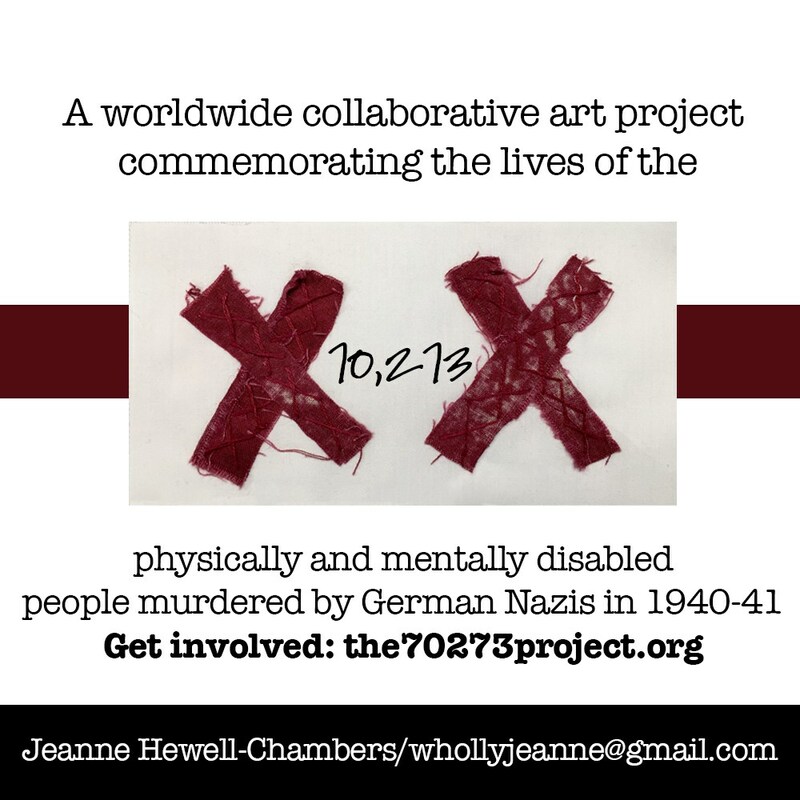 May such an atrocity as the T4 program under which the 70,273 disabled people were murdered never happen again. Ever. When I return from visiting DD#1 in Oregon I would like to contribute two blocks to represent two family members with special needs. That would be great, Janet! Yes, there are specific size requirements for the blocks. Blocks need to be one of these 3 sizes: 3.5" x 6.5" or 6.5" x 9.5" or 9.5" x 12.5". The base is white to represent the medical records, the only information the assessing physicians used to make their evaluation, and on the base are two red X's to represent the death sentence. No words or other embellishing, please. It's astounding how creative Makers have been and how each block is different . . . just like the people they commemorate. I read a lot of books about WW2 and therefore knew that this happened, but not the total number! I will make a few blocks too! Thank you so much for sharing. I was not aware that this took place before the Holocaust. I know of the practice, but the specifics. I will certainly send some blocks and share this part of evil history. Thank you, Lynda. Someone messaged me today that The 70273 Project gives her a way to turn her hate into something other than hate, something more loving and compassionate. How horrible. I was aware of this awful episode, but did not know the details. I will beintersted to know how the project comes together. My brother in law is 52 years old with Down Syndrome...he surely would have been put to death by the Nazis. He has brought so much joy to his family and really almost everyone who meets him...he was lucky his parents did not listen to the Doctor and institutionalize him as was the recommendation in those days. Thanks for this history lesson, I was unaware of it. Happy Sewing for a good cause. I know what you mean, Kim. My sister-in-law, Nancy, is mentally disabled as a result of a childhood brain injury. She may have a 12 word vocabulary, and she may need help with everything (and I do mean everything), but she is such a joy, such a treasure, such a wise woman. I can't imagine a world without her. She started drawing in June 2012, and I started stitching her drawings that very day. I was stitching her marks the night this crazy idea came and whispered in my hear. I'm glad your in-laws didn't listen to the medical direction of the time. what a fascinating and little known atrocity! I will make a few blocks too. Mental illness affects almost every single family in a large or small way. I'll check out the site and start sewing. No Lori - this was not a "downer" of a post. It is a reminder of terrible things that were done in the past. We must always be vigilant so that we don't repeat it. What a wonderful tribute to those nameless victims of "doctors" who did not deserve to use the name. Yes to everything you said. We must do everything possible to make sure such an atrocity never happens again. Ever. I never knew anything about this specifically. Thanks for the research!! I would very much like to help with the project too! I look forward to your participation, Randy. Thank you. Such an ambitious project! I'll make some blocks, too. Mental illness has hit home in our family, too. Hey Barbara! Thanks for your blocks and for the post on your blog. 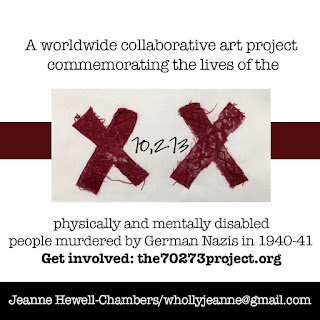 Lori D sure has brought a lot of new, creative, committed people to The 70273 Project! I'm glad you're one of them.